Want a shed you can be proud of? 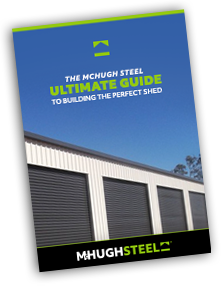 Get McHugh, Your local shed builders on to your Bundaberg or QLD project. As one of Queensland largest steel manufacturer and provider, we have a team of experts ready to help you with all your Shed, Roofing, Steel Framing, Relocatable or Rollforming needs. This genuine BlueScope Garage is 6m wide x 6m long x 2.4m high and comes with a personal access door and 2 roller doors 2.030 clearance height x 2.600 clearance width. We work alongside you to develop a design that fits the needs of your company, home or farming needs. Our shedding team are all QBCC fully licensed builders who hold a competitive pride in their quality of craftsmanship. As our promise to you, we work with you to ensure any problems are rectified in a quick & professional manner. Size is no problem! Build what you want & how you want it with our local, in-house design team. 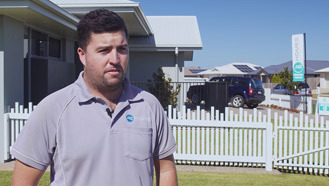 Get your shed & carports directly from the locally owned factory in Bundaberg, Queensland. 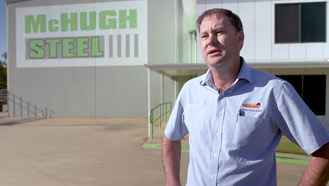 Established in 1992 as Outback Sheds, now McHugh Steel, but still Australian & family owned. 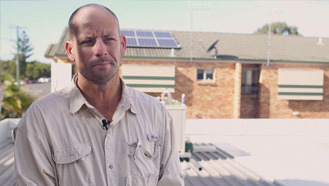 The leaders across regional QLD for all your commercial, industrial and domestic shed needs. Here at McHugh Steel we pride ourselves in the quality of work we deliver to our customers. Our sheds have to be the highest of quality in order to endure the elements we’ve grown to love in regional Queensland. Commercial sheds and garages are usually used as the first impression of most business or associations, and we understand that the best foot forward is important. We specialise in stadium, community and retail sheds and we’re proud to use BlueScope Steel and the full range of and Colorbond paints. Here at McHugh Steel we pride ourselves in the quality of work we deliver to our customers. 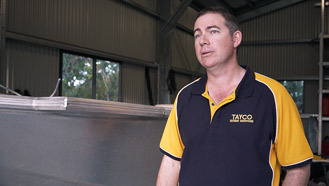 Our sheds have to be the highest of quality in order to endure the elements we've grown to love in regional Queensland. We have been building sheds since 1992 and our team of experts understand the needs of our local environment and take the time to design and build the perfect shed for your residential, commercial or industrial project. Our other trusted brands we use include B&D Doors that supply us with some of the best quality roller doors on the market, and all our windows are supplied by Bradnam's Windows & Doors. If we don't believe in a product, we simply wouldn't use it. Any roofing project undertaken by our team undergoes numerous quality checks to ensure you get what you pay for. A subpar roofing job can leave you with a hefty repair bill for both the roof itself, and for any water damage that you could encounter. Don't waste your time or risk your bank balance by relying on the cheapest offers on the market, invest in quality. Like all our products, our Colorbond products are made from BlueScope Steel and offers plethora of colours to choose from. We can supply and fit new roofing as well as replace or repair existing roofing. All of our fitters are fully licensed and all QBCC standards are met on each job. Our weather here in Bundaberg is never predictable, so choosing quality is the safest bet for our seasonal extremes. Prefabricated buildings are cost effective option for any small development and can be used for temporary, long-term or permanent building structures. They are also great for regional or remote areas where full on-site construction may not be possible. With the number of modular buildings we’ve built we’re sure to have a size and design that will suit your needs. We have designed and manufactured offices, weekenders, staff quarters, amenities blocks, laundries, kitchens and cabins. These can be fitted with electricity, plumbing and air-conditioning and be transported to the majority of locations. Pre-fabricated frames are an easy method of building your project. McHugh Steel is proud to announce that we will be the first in Queensland to have the rollforming machine, ENDUROFRAME®. The ENDURO™ rollformer is a highspeed rollformer used for precision manufacturing of light gauge steel frames made from TRUECORE® steel designed using the ENDUROCADD® software system. The rollformer is able to manufacture all the sections required for a house frames with high speed production. Truss and wall frame designs are detailed using the ENDUROCADD® software systems which are then manufactured on an ENDURO™ rollformer. The ENDUROCADD® software system is the only steel framing software package to be able to self-certify frames for non-cyclonic regions. Everything you'll need, under one roof! Rollforming is a process that is used to incrementally bend a metal sheet into identical panels that can be used for such things as cladding or roofing. The benefit of this process is that it quickly and accurately produces the panels at an unlimited amount of length. We manufacture many rollforming products such as C Purlins, Z Purlins, Sheeting, Gutter, Fascia, Flashings and Brackets to name a few. All our products are manufactured in our Bundaberg based factory using state of the art machinery with well-trained and experienced operators. Our sheds have to be the highest of quality in order to endure the elements we've grown to love in regional Queensland.